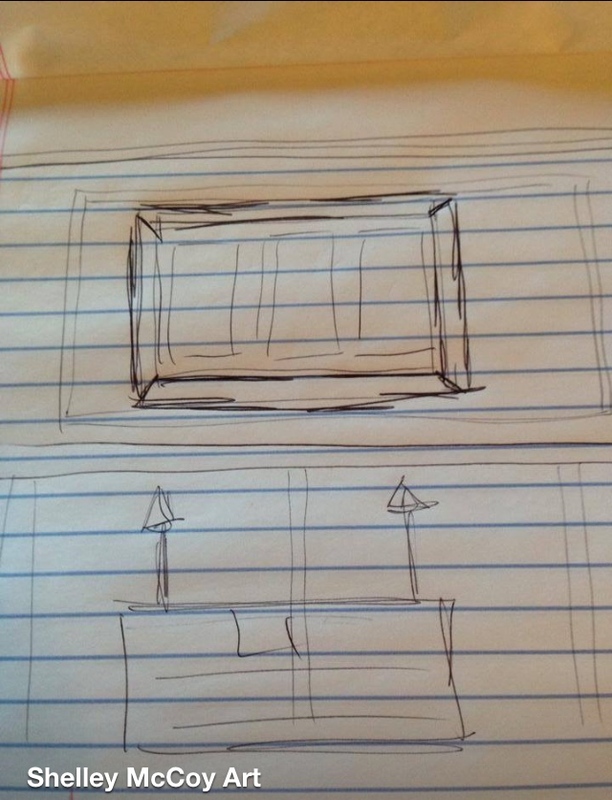 Moving can come with challenges when you have existing furniture and artwork you want to use. Sometimes that sofa fits perfectly and sometimes you need to make adjustments. Well, with artwork it can be just as challenging. In my cli ents case she had found the perfect spot for their artwork they had commissioned from me a few years ago in their new dining room. 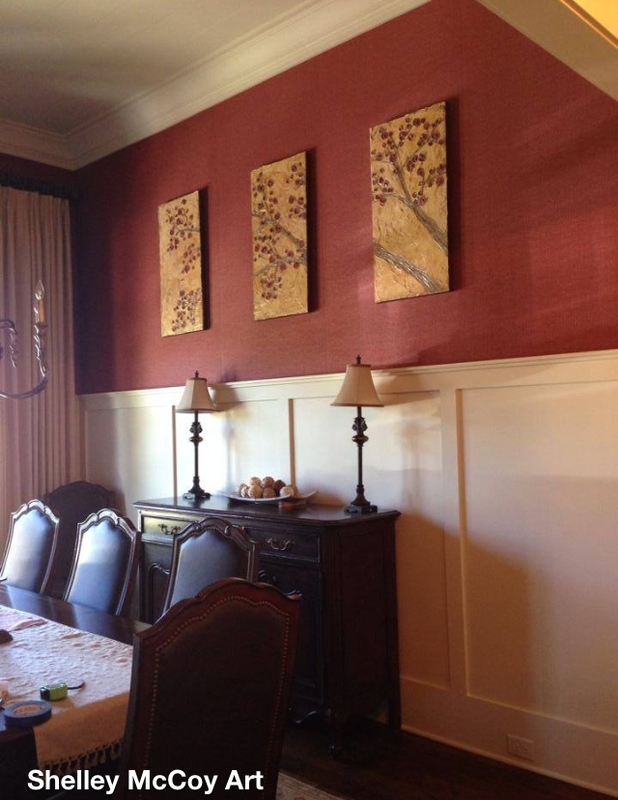 However, the grasscloth covering the wall was damaged where the previous homeowner had something hanging and the flaws would be seen with the tryptic properly spaced. So she asked me for some help on this particular dilemma. Their new home has lots of reclaimed elements…from the floors, barn doors, old beams, and special furniture pieces. So using the reclaimed barn wood was a natural fit and actually helps the more traditional dining room tie into the adjoining family room and kitchen area. My client and I went on a reclaimed shopping excursion and picked out two fairly straight boards and two that had more character. Which this only adds to the beauty of the frame. The finished framework also has a touch of rusted metal to accentuates the artwork and adds another detailed element to the entire project. Do you have a project in need of creative camouflage? 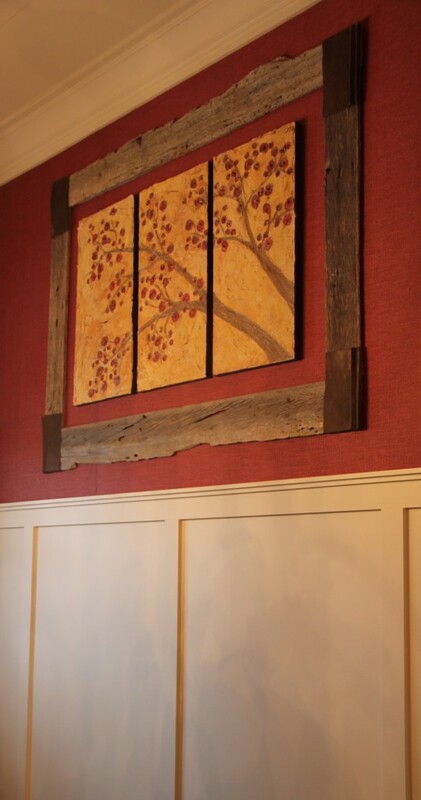 Also, check out the artwork I created for this same client using reclaimed wood.